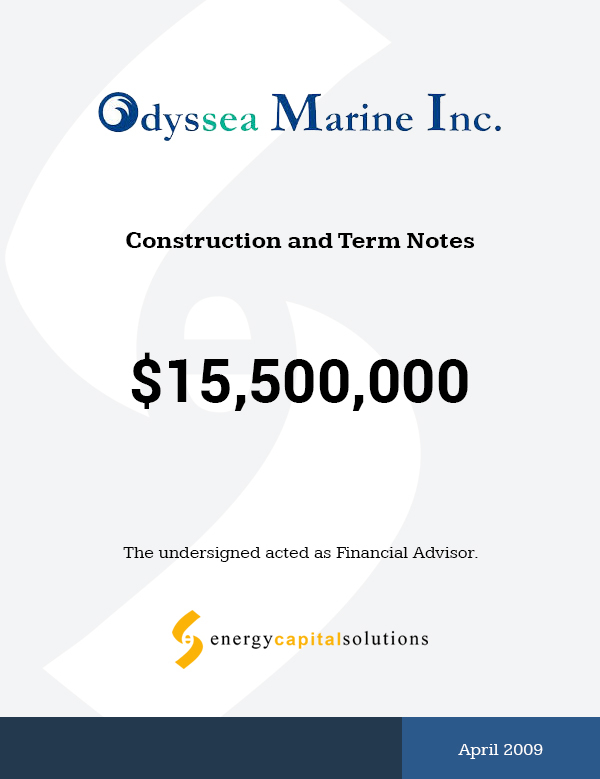 Transaction Structure – $15.5MM of senior term notes, secured by Odyssea’s fleet, used to finance the acquisition of three new tug vessels. March 2009 – ECS was engaged by Odyssea Marine, Inc. (“Odyssea” or the “Company”) as its exclusive financial advisor to raise debt capital. April 2009 – ECS closed the $15.5MM senior term facility transaction with Capital One, NA. Favorable Financing Terms – Odyssea received a term loan for 80% of fair market value of its assets in a challenging market. LIBOR-based facility with no prepayment penalty. Extensive Marketing Effort – ECS contacted more than 40 senior lenders in the oilfield services space. Quick Execution – ECS completed the transaction in approximately 8 weeks in a difficult marketing environment.